Do baby boys really prefer toy guns and cars? Do baby girls really prefer Barbies and dolls? Several studies have been conducted on this and guess what? 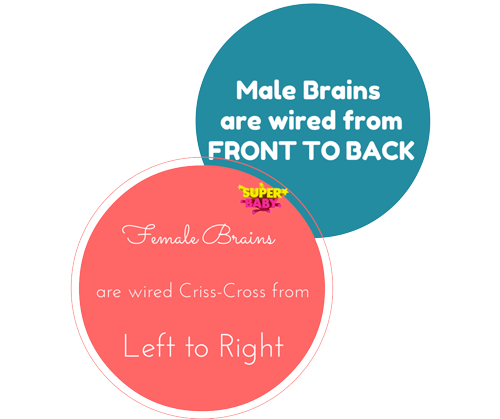 DIFFERENCE BETWEEN A GIRL’S BRAIN AND A BOY’S BRAIN! But, this difference is very minute at birth. Parents, have the MOST EFFECT on shaping a child’s brain. So what are we going to tell you about in this article? How exactly should you train your Baby’s Brain? Who is harder to raise – A girl or a boy? The fact is, it is difficult to raise both boys and girl- But in different ways. This difference is not just because of gender. It’s because of difference in the wiring of the brain. In Pennsylvania, some scientists scanned the brains of 1000 males and females aged between 8 and 22. A Neuroscientist at Rosalind Franklin University of Medicine and Science, Lise Eliot, wrote a book called Pink Brain, Blue Brain. She conducted several tests on male and female babies to understand the differences in their brain. When 6-12 month old boys and girls are shown dolls and trucks BOTH GENDERS PREFER DOLLS. Eliot gathered 11 month old babies (both male and female) and their mothers. She conducted an experiment to check the mother’s estimation on how steep a slope their babies could crawl. Mothers of BOY BABIES got it almost right to within 1 degree. However, mothers of GIRL BABIES underestimated their babies by almost 9 degrees! 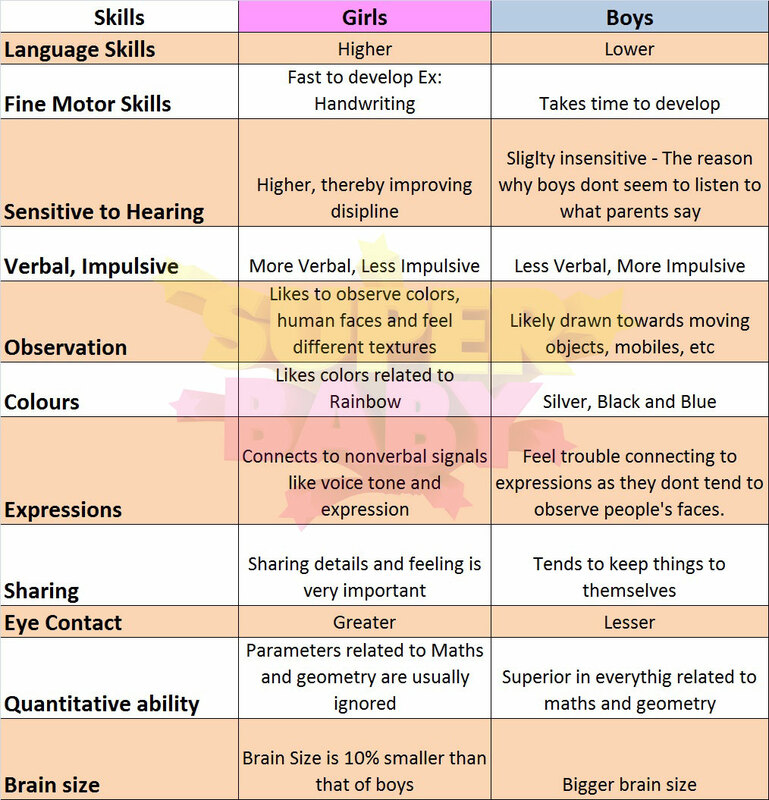 This shows that there is actually almost NO DIFFERENCE between motor skills of baby boys and baby girls. 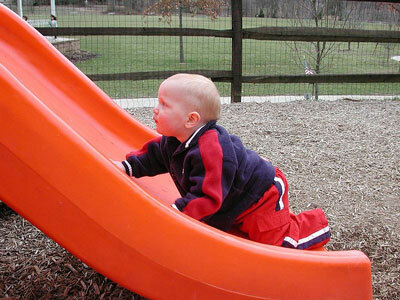 It is in fact, a MYTH ASSUMED BY PARENTS that, boys are more capable of better accomplishing physical activities. Only after a boy/girl turns 3, does he/she realise that he/she SHOULD BE playing with ‘BOY TOYS’ or ‘GIRL TOYS’. In simple terms, by not restricting the type of toys to boys and girls, parents can provide a 360 DEGREE BRAIN DEVELOPMENT. 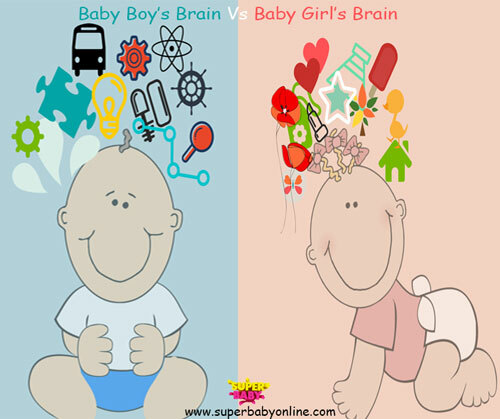 Brain structure is responsible for many developmental differences between boys and girls. Give your child all dolls and toys, IRRESPECTIVE of gender. This, to some extent, diminishes the gender gap and your child shall have all the positive traits of both a boy and girl, WHICH IS GREAT! This approach, termed as a ‘GENDER NEUTRAL’ approach has a successful track record. Trust me! You should try it too. and a baby boy’s brain is programmed for maleness. A boy’s brain weight and volume are 10 to 15 % greater than a girl’s brain. When the right side of the brain tries to send connections to the left, the appropriate cells DON’T YET EXIST IN A BABY BOY’S BRAIN. As a result, the fibers go back to the right side. This enriches the connections within the right lobe. Boys have greater spatial awareness and abilities. Boys’ spatial abilities include judging of distances, reading maps, recognizing geometrical shapes and negative emotions like distress. Boys show less fear on separation than girls because they have slower message transmission than girls, until the brain matures. From as young as 9 or 10 months, they bring their fear under control by activities such as playing with a toy or crawling to investigate an object so as to distract themselves. This mode of behavior continues into childhood. At birth boys have a higher level of the male hormone testosterone which is linked to aggression and high activity. They tend to be more adventurous as they are more likely to take risks. By the time they are 2, boys like to play rough and tumble games and they like toys like cars. While still in the womb, THE CORTEX, which determines intellect, develops sooner in girls than in boys. The left half of the cortex, that which controls thinking, develops earlier in girls than in boys. The corpus callosum, that part of the brain which connects the right lobe to the left is better developed in girls. The earlier development of the left side of the brain in girls means that girls have GREATER LANGUAGE SKILLS than boys. The right and left sides of the brain communicates with each other earlier and better in girls. This helps them to develop reading skills (which use both sides) earlier. Girls show earlier and greater fear on separation than boys because their nervous connections mature earlier. This leads to faster message transmission than in boys. Girls recognize earlier what’s going on around them. How can you give your child an overall 360 degree brain development? DON’T INTERRUPT him when he is doing a puzzle even if he makes a MISTAKE. Improve his sensitivity to hearing – if you have given him an order, make sure he follows it. Get him involved in ART and CRAFT activities. Don’t tell him ‘Boys don’t cry’. If she falls while running, DON’T run to her. Let her get up herself. This will develop RESILIENCE. Don’t UNDERESTIMATE her physical ability. It is you who is teaching her that, girls are sensitive and boys are strong. Don’t dress her up in pretty clothes on a DAILY BASIS. Make your daughter play with LEGOS and construct what she wants. Don’t say ‘Good Girl.’ Instead, say ‘Clever Girl’, ‘Smart Girl’ etc. Buy her lot of puzzle books. Keep asking her questions and encourage her to be curious. A baby’s brain is flexible. Don’t restrict it. Whether it is ‘his brain’ or ‘her brain’, allow it to develop to the maximum. What is 360 degree brain development?